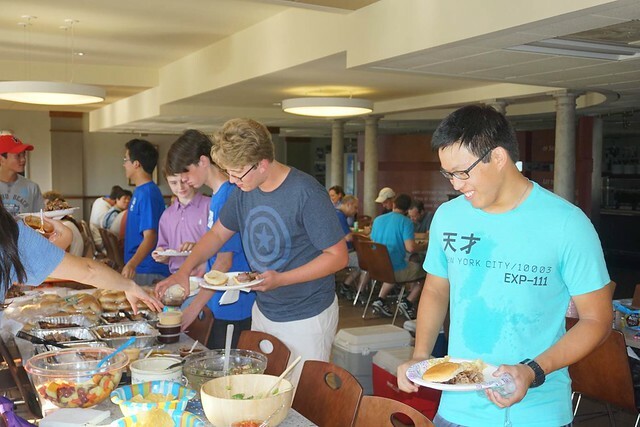 On Sunday, Aug. 28, Priory hockey players, coaches and their families enjoyed a Priory Hockey Family BBQ in the Dining Hall. More than 80 guests attended and enjoyed a delicious potluck dinner featuring Sugarfire BBQ and loads of appetizers, sides and desserts brought by the families. The event welcomed the players back to school and gave incoming Form I hockey players and their families a great opportunity to meet current participants in the hockey program. Coach Jeff Smith welcomed Jason Getz, Priory Chemistry teacher, as a new addition to the hockey coaching staff and provided an overview of the winter season. The dinner was a great evening enjoyed by all.